Welcome to this week's edition of “World Out Of Whack” where every Wednesday we take time out of our day to laugh, poke fun at and present to you absurdity in global financial markets in all its glorious insanity. Occasionally we find opportunities where we can buy (or sell) assets for mere cents on the dollar - because, after all, we are capitalists. Unlike America, the Chinese don't pretend the people actually have a say, but they do have their own problems to deal with. Namely keeping the Chinese remnimbi from suffering its own version of a cliff dive - an increasingly costly and desperate affair. The PBOC just released FX reserves showing us the battle scars. You'd be forgiven for thinking $3.12 trillion is a lot of money. Sure, like a good push up bra, it looks impressive but actually isn't. In proportion to China's economy, and especially given their managed currency, the number is both inadequate and falling fast. 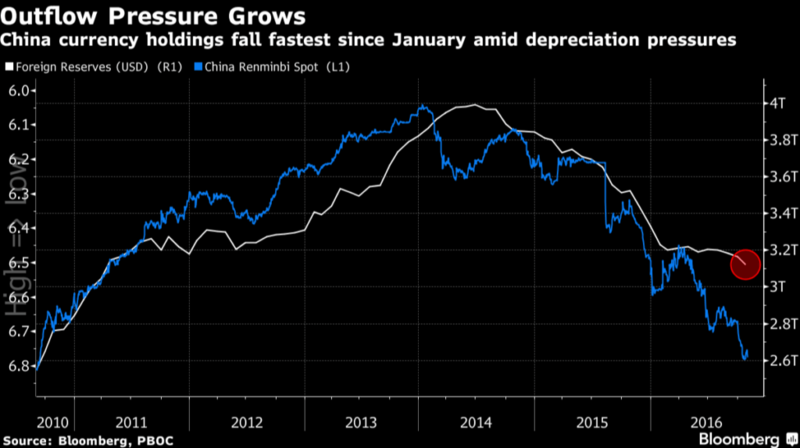 "Buffers, while still adequate, are shrinking fast, calling for urgent action to address rising risks,"
The fact is that China's financial system is haemorrhaging capital. For some background on the topic of identifying the first cracks in this system go read "What's China's Banking System Telling Us" written back in December of 2014. That, my friend, was when there was REAL asymmetry in the trade. Volatility was extremely low and risk simply not priced. That was then and this is now. Money has been made (a lot) but I don't believe the fat lady has sung her last song yet on the renminbi. Interbank borrowing costs are rising once again and have just hit an 18-month high. Three-month dollar LIBOR rates have shot up by over half to 0.89% since June, draining liquidity and raising borrowing costs for the world's dollarized financial system - which is to say everybody. This puts pressure on bonds everywhere but our focus today is on China. After all, it's China which sports an impressive credit bubble, overvalued currency, and an over-leveraged banking sector. 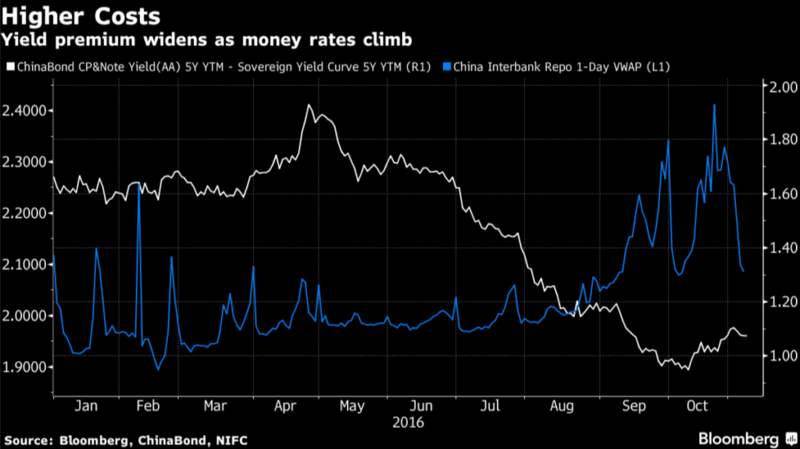 Chinese investors have been pouring money into corporate bonds in anticipation that the PBOC would keep rates low due to a slowing economy. Looking at China's domestic market this all makes sense. Fiscal policy has NEVER in Chinese history been looser or credit cheaper. Bonds make all the sense in such a world, and corporate bonds pay higher yields than sovereign so it's understandable that investors have poured money into this asset class. As more money entered bond yields fell, causing more investors to come into the market anticipating ever higher bond prices, increasingly buying not for yield but for capital appreciation. We've seen this game before. The credit cycle is turning and the key factors which have driven it are reversing leaving the PBOC in a sticky situation. On the one hand they're dealing with capital outflows as well as speculation, especially in the real estate markets. In order to curb these issues they've focused on cutting debt, thereby pushing up short term borrowing costs. Doing so at a time when the global credit cycle pivots and (we believe) is turning on its heels. Now as yield premiums rise on corporate bond issues, investors are caught off guard. Bond prices apparently don't always go up. Whowouldathunkit? It's the old "safety trade" except investors are finding out that nothing is safe if it's overvalued. Investors tried to buy "safe, yielding assets" except as is so often the case they've missed the underlying global macro trends in motion. Operating in a microcosm of domestic variables they've missed the bigger picture. Now, as borrowing costs rise and investors want out, the risk is they'll find liquidity only exists when sufficient market participating are entering the market. When a sufficient number turn around and exit liquidity disappears. A problem! As liquidity dries up yields rise, and those holding commercial paper and corporate bonds see what is quickly turning red... get redder (if red can actually get redder). These stresses in the banking system increase pressure to relieve those stresses. The obvious exit valve? The currency. In addition to rising interbank borrowing costs, China just reported exports fell for the 7th straight month in a row. Putting two and two together we know that a strong yuan means imported goods cost more at the same time that exports are falling. The depreciation of the yuan (about 9%) has certainly helped buffer some pain but not all. Pressures, they are mounting. I'm prepared to wager that at some point the PBOC scour the room, see the BOJ in the near corner, stoically and determinedly taking a sledgehammer to the yen, they see the central bank of Korea in the far corner mumbling to themselves about letting go of the won, they see the ECB sitting on the bar stool munching on a frankfurter actively devaluing, and they come to the very sensible conclusion that burning the furniture to keep the house warm leaves you with toasty feet but nowhere to sit. Thirty years ago they were sat on mud floors with no furniture. Today they sink into luxurious sofas as China's GDP has been expanding at around 10% annually for 30 years (3x the global average), propelling an entire nation out of poverty. Are they going to squander away all their wealth when both economically and politically it would be very easy to release the pressure valve and let the yuan slide? And 2 days later they abandoned the peg. Why do I mention our cheese and watch making friends? The PBOC has been regularly promising markets that there is nothing to worry about and that a devaluation is not in the cards. "The Chinese government has no intention to stimulate export by means of devaluing the yuan, let alone waging economic wars. In reality, the yuan has retained basic stability to the currency basket, and there is no basis for its continued devaluation. We will carry on gradually implementing reform to the currency exchange rate setting mechanism, and we will maintain the yuan's value at a rational, stable level," Li said in a phone conversation with International Monetary Fund (IMF) Managing Director Christine Lagarde, according to a statement by the Chinese Foreign Ministry." Opening the capital account as is required can't be done without leaking capital out. Beijing know this and are trying to devalue but in an orderly fashion. Question is, will it be orderly? It's always the dollar. If we get a stronger dollar, this will put increasing pressure on the renminbi and that means increasing pressures on the PBOC to try hold it up. And that will put increasing pressure on FX reserves. Stricter capital controls. Beijing have been doing their damnedest to put a lid on capital outflows, restricting the buying of offshore insurance products (a popular method of exporting large amounts of yuan out of the mainland), and restricting the use of bitcoin amongst other controls. Rising global borrowing costs threaten to cut reserves. Something both the world and China is totally unprepared for. Feedback loops in currency markets often accelerate existing trends. A stronger dollar... ergo weaker yuan causes more frightened money to exit which then causes more frightened money to panic causing higher relative borrowing rates, and as the cost of domestic capital soars the leverage built up in the system can quite quickly implode. Ever watched sheep once they all get moving? Know anyone that might enjoy this? Please share this with them. Investing and protecting our capital in a world which is enjoying the most severe distortions of any period in mans recorded history means that a different approach is required. And traditional portfolio management fails miserably to accomplish this. And so our goal here is simple: protecting the majority of our wealth from the inevitable consequences of absurdity, while finding the most asymmetric investment opportunities for our capital. Ironically, such opportunities are a result of the actions which have landed the world in such trouble to begin with.